Reflector sights, more commonly referred to as reflex sights, have been around for over a century. The very first working reflex sight was invented by an Irishman and saw use in World War I. The idea originally came about because of the fact that iron sights could be hard to utilize in certain scenarios and telescopic sights, though accurate, had their inherent downsides, the worst of which being the limited field of view as they were designed only for long distance shooting. The first reflex sight was invented in the 1900s. It was so good that in 1918, it had to be used as the targeting system of choice for German fighter planes. The design saw many improvements after World War II from companies like The Swain Nelson Co. of Glenview Illinois and The Giese Companies of Dubuque, Iowa, but it was in 1972 when the first reflex sight that used a red dot went on the market. It was called the Weaver Qwik-Point. In 1973, Aimpoint, a Swedish company, came up with their own design for a civilian-use reflex sight. It also had a red dot, and they claim was the first to ever utilize a light emitting diode, which resulted in it having a longer battery life compared to their competitors’ reflex sights that used incandescent light bulbs which drained the battery in a few hours. It was called “Aimpoint Electronic”. For decades Aimpoint would dominate the US reflex sight market. 1 What Are Red Dot Sights Used For? 3 How Accurate is the Trijicon MRO? What Are Red Dot Sights Used For? It isn’t uncommon for anyone to close their weak eye and only use their dominant eye when looking through their gun’s iron sights — and while it can be argued that trained professionals can use iron sights with both eyes open, getting to such a level of competence takes a lot of time and dedication, two things not many people have a lot of. Red dot sights, by their inherent design, allow for faster target acquisition, faster transition between targets, faster aiming after bringing the gun up, and better field of view. In home and personal defense situations, having one point of aim instead of aligning front and rear iron sights with a target allows for faster shots. It is especially useful in highly stressful CQB scenarios where a man’s natural instinct is to just point and shoot, which is why the police and the military favor these sights. For some hunters who hunt in low-light conditions or in situations where contrast between sight and the environment is needed for accuracy, e.g. 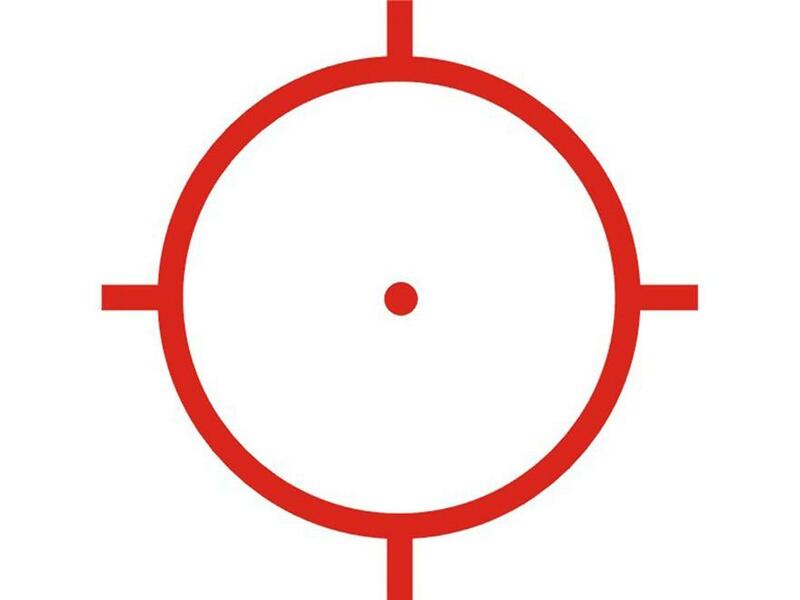 snow, there are red dot sights that allow for pinpoint-accurate shots at up to several hundred meters. Trijicon is fairly new to the red dot sight market, but they have a great track record with their ACOGs (Advanced Combat Optical Gunsight) which are the standard optic issued to the US Marine Corps. These are known for their durability, ruggedness and reliability. The Trijicon MRO (which stands for “Miniature Rifle Optic) was released in late 2015. The housing measures 2.6 inches in length and is made of forged 7075-T6 aircraft-grade aluminum that has an ultimate tensile strength of 74,000–78,000 psi and yield strength of 63,000–69,000 psi. It weighs about 4.1oz without the mount and is O-ring sealed, making it very durable. It also has a hard, matte black anodized finish which makes it aesthetically pleasing and easy on the eyes while resisting corrosion. There are six red dot brightness settings and two night vision brightness settings on the illumination dial mounted on the top of the scope, which makes it ambidextrous. This enables the user to adjust the brightness without having to take their strong hand off the grip and trigger. Except in the brightest of daylight situations, the 3-setting on the illumination dial is sufficient and will get the job done. The 4-setting and 5-setting will be great for some people when using the sights in daylight situations. The 6-setting is just a little too overpowered but it’s there if the 5-setting isn’t enough. The two night vision settings are, well, for night vision. Nothing much can be said about those settings except they’ll come in handy for nighttime shooting. Trijicon MRO’s battery holder with its cover is conveniently positioned on top of its illumination dial. The cover is exceptionally easy to unscrew and put in using a coin or a small screwdriver. Inside it there’s a warning to make sure to install the battery the right way or it’ll bust some of the little “teeth” that hold the battery in place. It uses CR2032 lithium batteries that Trijicon claims can last for up to five years with continuous use as long as the brightness stays at the 3-setting. Upon purchase the battery comes free with the sight. The windage and elevation adjustment turrets are flushed and can be turned with a coin, or a small screwdriver, or the rim of your ammo casing (a few owners reported that the turrets can be turned with the rim of these common rifle calibers: 5.56×45mm, .223 Remington, and 7.62×39mm). Because the windage adjustment turrets are flushed, it makes it difficult to brush or move them when the user doesn’t want to. There’s also no need to cover them with caps, so there are no caps to lose.This feature, along with the illumination dial being mounted on the top, makes the Trijicon MRO ergonomically superior to most of its competitors on the market. What sets the Trijicon MRO apart from all the other red dot sights on the market is its objective lens size. Most red dot sights on the market have lenses that measure only 20mm. 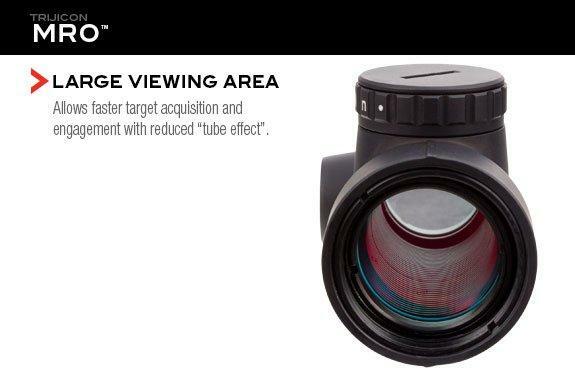 They’re effective, make no mistake about it, but Trijicon MRO’s objective lens measures 25mm, a whopping 20% improvement in sight picture which allows for better field of view and eliminates any “tunneling effect”, i.e. with other sights you get the feeling that you’re looking through a tunnel, which can sometimes result to eye fatigue. The MRO’s lenses have infinite eye relief and are easy on the eyes. The lenses are recessed a bit and angled for reduced light reflection and glare and for protection. They’re multi-coated with a slightly bluish tint but they’re crystal clear, very durable and very tightly sealed. The lenses were also filled with dry nitrogen and tested to work within temperatures of -60 °F to 160 °F, which makes them fogproof. They’re tightly sealed so they’re waterproof down to 100 feet (30 meters). How Accurate is the Trijicon MRO? Each adjustment turret can be turned to a maximum of 70 MOA, with each turn equal to a 1/2 MOA. The Trijicon MRO is capable of 2.0 MOA at up to 300 yards and is parallax-free, which means the red dot will stay on target no matter which angle you look from behind the sights. Once sighted in, it will happily make 1- to 2-inch groups at 200 yards. 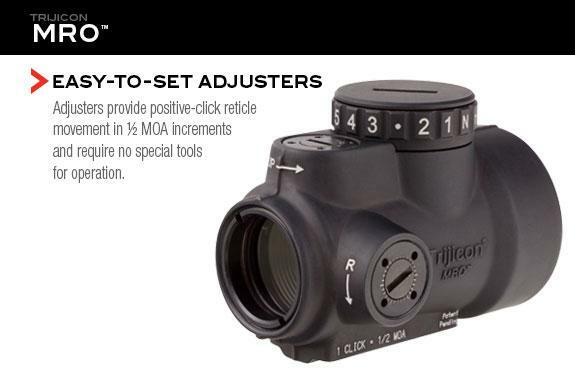 There are several options for mounting the Trijicon MRO to your favorite rifle. For more info, check the section of this review titled “A Note on Co-Witness Mounts”. An improved model packed with even more features, the Trijicon MRO Patrol was introduced January of this year and has been on the market for several months now. It is more expensive, but you get what you pay for. The Trijicon MRO Patrol is pretty much the same as the original MRO. It has the same rugged construction and reliability, the same hard black anodized finish, the same 25mm lens, the same flushed windage and elevation adjustment turrets, the same illumination dial mounted on top, and the same battery placement. But it has additional features, the first and most apparent one is the weight and length. Patented ARD (anti-reflective device) called killFLASH, which further reduces glare and reflection in bright daylight situations. In night time gun fights, it also serves the added purpose of making sure your lenses do not reveal your position to the enemy by not reflecting any visible shimmer of light to them. Some users report that the killFLASH darkens the lens a little, but for its intended purpose it should do more good than harm. The killFlash can be installed with or without the flip-up lens caps. A small but noticeable is with the first time battery installation. On the original MRO, the battery has to be installed by the user after purchase. The MRO Patrol comes with the battery pre-installed, which is a good thing for first-time users because they won’t have to mess with the rather fragile “teeth” — the metal contacts that also hold the battery in place. The MRO Patrol can also use a quick-release (QR) mount system that is not available with the original MRO. With a counter clockwise turn, the quick release system loosens the tension between the mount and your gun’s picatinny rail, allowing for faster dismounting and remounting of the red dot sights. When mounting any reflex or red dot sights to your gun, one important factor to take into careful consideration is the height of the optics attachment. Firearms enthusiast use the term Co-Witness to refer to the sight picture resulting from adjusting the height or the distance between the top railing of a gun (i.e. the picatinny rail on top) and the aimpoint in the optic system (i.e. the red dot on the MRO sight). Mounts are generally classified as either an Absolute Co-Witness or a Lower 1/3 Co-Witness. An Absolute Co-Witness mount sets the optic up in such a way that the aimpoint, or the reticle, is right in the middle of the front and rear iron sights. This setup is ideal for people who are small in stature, or for people with relatively short necks, as they can have a firm cheek weld without having to raise their head up a bit higher like they would if their gun is set up for a Lower 1/3 Co-Witness mount. The problem with this setup though is the sight picture looks kind of cluttered because the front and rear iron sights’ full length are occupying most of the lower half of the lens (this problem is non-existent though if the gun’s iron sights are foldable). Also, this might not work well for taller people or for a few who have longer necks. A Lower 1/3 Co-Witness mount sets the optic up in such a way the the aimpoint, or the reticle, is raised slightly higher, approximately a quarter of an inch, from the iron sights. This setup is ideal for people who are bigger or taller in stature or those who have longer than average neck, as they will have a perfect cheek weld with the slightly higher position of the reflex sight attachment. This also works well for guns that have fixed front and rear iron sights, as the sight picture will be bigger. It won’t look cluttered because it will only show a small portion of the front and rear iron sights protruding from the bottom of the optic. The problem with this setup is if the user is a short person or someone who has a short neck. They will have to raise their head up a little to look into the reflex sight and take aim, which may results in a loose cheek weld, which affects accuracy and in turn defeats the point of using a reflex sight in the first place, and may also result in neck fatigue. If you’re short or you have a shorter neck, using an Absolute Co-Witness is almost a must, unless you have a stock that can be adjusted for a higher cheek weld. Otherwise, you might have neck fatigue when shooting for longer durations. If your gun has foldable front and rear sights, you can go with either Absolute or the Lower 1/3 Co-Witness mounts without the cluttered sight picture issue. It’s all a matter of comfort in this case. Just go with whatever setup feels comfortable for you. If you’re tall or you have a longer neck, using a Lower 1/3 Co-Witness mount is almost a must. If your gun has fixed front and rear iron sights, the Lower 1/3 Co-Witness mount is the better option, but it’s not required. If you’re tall and your gun has fixed iron sights, the Lower 1/3 Co-Witness mount should be considered a requirement, otherwise you might have issues with accuracy. 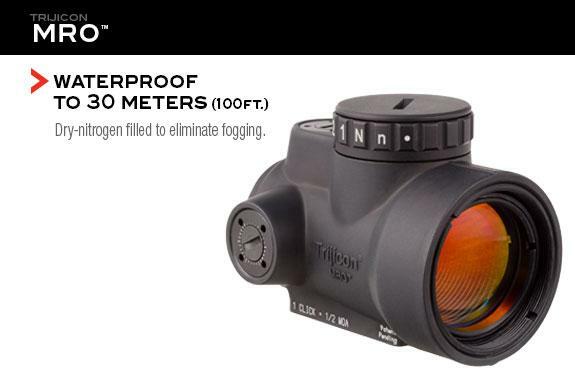 All prices on this review are from Trijicon’s website. As of this writing, the original Trijicon MRO without mounting costs $579, and the Trijicon MRO Patrol model without mounting costs $849. The original adapter costs $60 for either Absolute or Lower 1/3 Co-Witness mount, and the quick-release version for either Absolute or Lower 1/3 Co-Witness mount costs $145. The original MRO packaged with a “low mount” (neither an Absolute nor a Lower 1/3 Co-witness) costs $629, which is $50 more expensive than the sight’s base price. 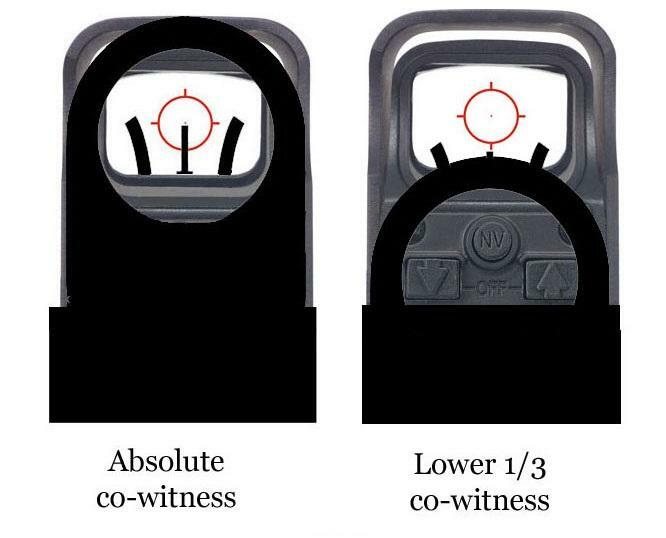 When bought packaged with either an Absolute or a Lower 1/3 Co-Witness, it costs $639, which has an increase of $60 compared to the sight’s base price. The MRO Patrol version packaged with the quick-release version of either the Absolute or the Lower 1/3 Co-Witness mount costs $919, which makes it just $60 more expensive than the sight’s base price. Amazon and eBay have sellers that are selling these sights for much lower, but we are not including pricing info from those websites in this review simply because prices vary greatly from one seller or merchant to another. (Note: “Absolute” Co-Witness appears on Trijicon’s website as “Full” Co-Witness. These both refer to the same type of mount). Sure, there are plenty of cheaper red dot sight alternatives out there that cost only a couple hundred bucks, and you can buy five of those for the price of just one MRO. But sometimes it’s better to take a one-size-fits-all approach and spare no expense on quality. 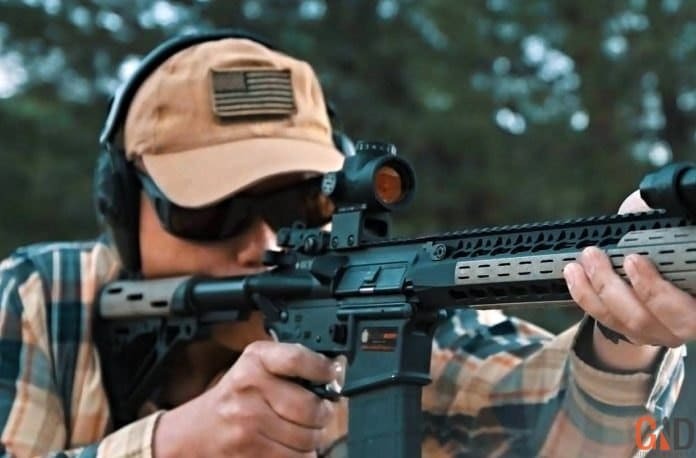 It’ll be wise to have a single combat rifle setup that’ll be great for every imaginable personal, home defense or hunting scenario, such as an AR15 with a Trijicon MRO and a flashlight attachment. If you’re in the market for one of the best available red dot sights and money isn’t an issue, the Trijicon MRO and the MRO Patrol are both solid options. But as with any other red dot sights, just make sure you choose the right mount.